Ceredig was born in his father Cunedda Wledig's original homeland of Manau Gododdin around the Upper Firth of Forth. When called upon to expel Irish invaders from North Wales in the early 5th century, he travelled south, with the rest of his family. 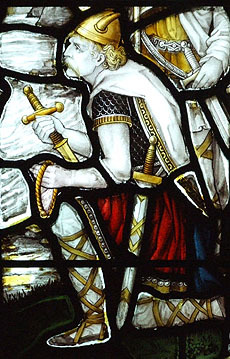 He fought bravely against the advancing Gaels and his father rewarded him with the most southern area of his new kingdom, bordering on Dyfed, possibly including part of the Cantref Gwaelod. Here, he became a great patron of his brother-in-law, St. Curig. The region became so associated with Ceredig that the people named it Ceredigion after him. In his old age, the kingdom was attacked once more by the Irish and he was persuaded by his counsellors to abdicate in favour of a younger man. However, his heir, his eldest grandson, Carannog, declined the offer of the Crown in order to become a hermit. Instead the people of Ceredigion had to look to Ceredig's second son, Usai.